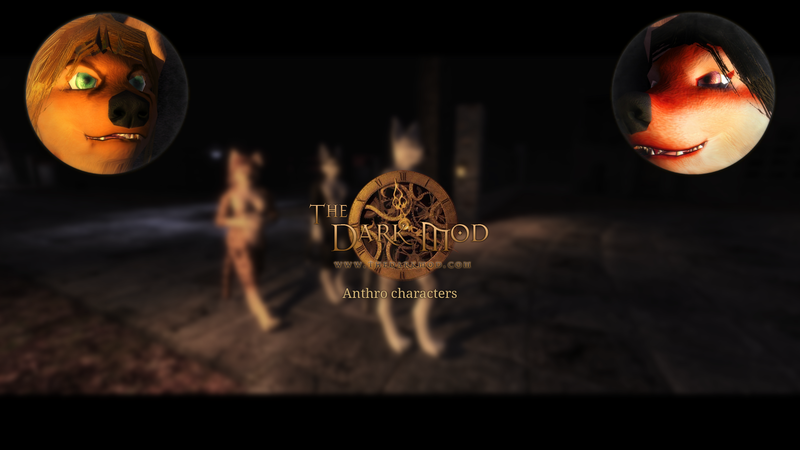 After several months of working on this project, I'm happy to finally announce the release of my anthro character set for The Dark Mod! 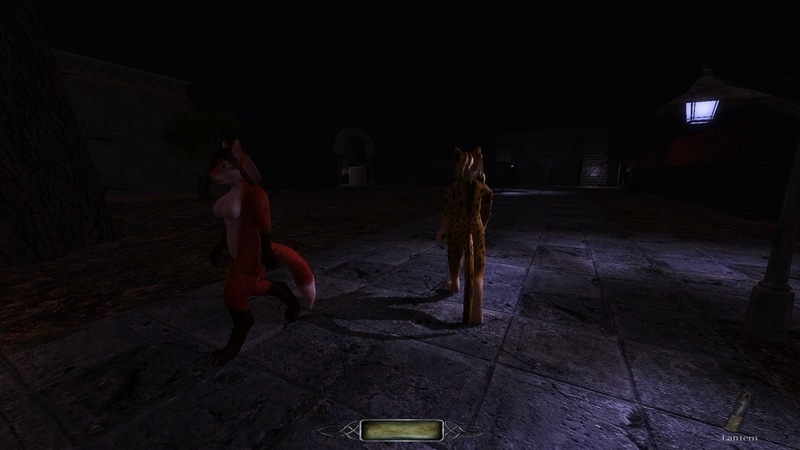 The package contains anthropomorphic characters for use in fan missions, with which artists can include furries as part of their story. Below is the repository, as well as a short FAQ describing the mod in more detail. The character set is meant to be used with fan missions. To include it, first clone the GitHub repository mentioned above somewhere on your drive. Then simply copy all of the directories into the root directory of your FM (eg: darkmod/fms/myfm/). You should now be able to find the characters in DarkRadiant under the AI section and add them to your map! There are 5 species, 7 overall fur patterns, 3 character definitions per race, plus male and female versions of each person. Races include wolves, foxes, leopards, squirrels, rabbits. Voices, personalities, as well as other traits were carefully tweaked to match each character as closely as possible. What license is the mod, and who are the authors? Wait... so was this made by furries? 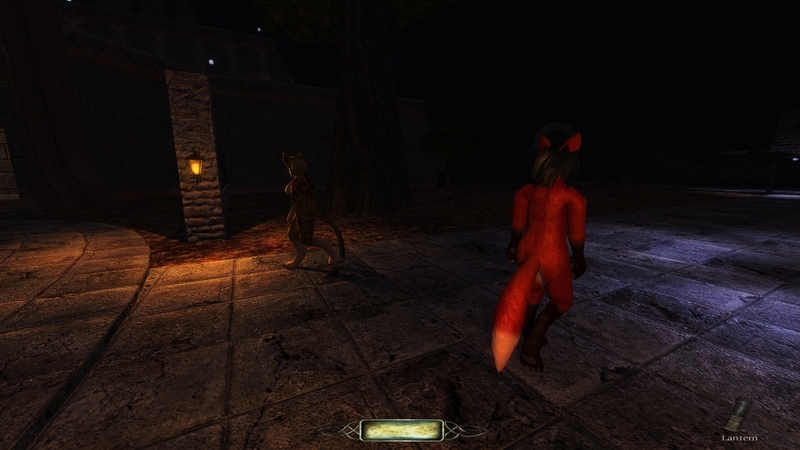 The mod was put together by me (MirceaKitsune) and I am indeed a furry. I chose to clarify this as I'd like to avoid negative remarks on the aspect; This is a contribution I made with enthusiasm and attention to detail for The Dark Mod, same as all contributions done by other artists in the TDM community. I've spent a lot of time adapting the mesh, rigging it, creating the materials, setting up definitions, and testing against long loading times. I don't care whether someone has a negative opinion of the furry community, but please respect the work that was put into this project at least. How can I support the mod? Although the mod itself is released under a free license, I won't accept financial contributions, in order to respect the wish of the community for The Dark Mod to not be used commercially. The most important way in which you can support my mod is to use it: If you're a fantasy mission creator who is a fan of anthro characters, include this into your FM and add the characters to your world! Also, if you notice any bugs or wish to improve something, feel free to inform me or send me your contribution or open a pull request on GitHub. Lastly, if you believe the characters might match the theme and quality standards needed for inclusion, support adding them to The Dark Mod! Edited by MirceaKitsune, 18 October 2016 - 09:12 AM. Well ... We always tell people if they really want something & no one else will make it, they are invited to do it themselves, and that's exactly what you've done here. So in that respect, props to you for living up to the TDM DIY spirit! I have no doubt this was a lot of work, so props for that too. That said, I don't want to say too confidently you're the only furry-TDM crossover fan, but I think you're in a minority. That's fine. People like what they like. I'm just thinking if you want to see them in the game, in an FM made for them, you might be the one person that would actually make such an FM. So I hope you'll give it a try. If you'd like some inspiration, if you don't already know about her, you might like KFort's FMs (http://thiefmissions...t&sort=author#m), who was known for making T2 FMs with quite a bit of fluffy in them. Those turned out to be pretty popular among some fans, so yours could be too. I'm all for mission variety, so you've got my support. Some things I will just suggest, others I might take time to implement on my own. It depends on how difficult it is, how much it motivates me, and how likely it is that someone else could do it more easily. Making feature complete and functional TDM characters is actually quite complex... in this case my skill with Blender and GIMP ultimately helped me, so I could produce everything needed to make this fully functional. A variety of FM's are created frequently, so I imagine someone will use this at some point, hence why I share it as an easily installable plugin. Of course I plan to make my own FM's with it too at some point. children using kids story ideas. up and used in an FM, you'd need to lay those ideas out. Another issue that doesn't help is the image is mostly blurred out so we don't see the figures fully. but I'd need a layout of characters and planned uses. happy to make an FM around it, then you could make a little video and show us that. Edited by NeonsStyle, 19 October 2016 - 06:18 AM. Hmmm... I didn't think about laying that out better. In a nutshell, they are intended for FM's that take place in different time lines (of natural evolution) where anthro animals have evolved alongside humans, but are otherwise in the same medieval / steampunk style. As I later add definitions using the heads and tails with existing bodies, they will be able to have any job and be part of any social class... such as guards, maids, drunks, etc. So I imagine mission layouts generally being the same: You play as a human employed to carry out given missions in urban areas (usually to steal stuff), but in some towns and houses you will encounter other intelligent races too. They'll still have loot you can steal, notes you can read, patrol an area as you hide in dark spots, etc. The main differences will be in the story: Anthros will obviously have somewhat different habits and personalities, and it's easy to imagine a world where there is some racism between them and humans. The only things that upset me are the visible seam around the neck, as well as the hair looking weird sometimes (due to bad alpha sorting). I'm not sure if and when and how I can fix those problems, but until then the current versions will have to do. Putting that aside, I feel they turned out pretty realistic and fitting to the atmosphere! Edited by MirceaKitsune, 19 October 2016 - 07:06 AM. Maybe they have a bit too big eyes so they look like puppy or manga. Otherwise they could act as "friendly" representations of some non material entities, especially in collaboration with distorted, bloody, decayed versions of themselves (good cop bad cop). They may be materialisations of some psionic kid's mind, or retrospective dreams placed in childhood times. They could fit as carnival suit or Donnie Darko style stranger disguise. I have a hard time imagining how the legs work with our current animations...did you make your own? Also, what did bones you weight the tail and ears to? The legs work perfectly fine: I remember I had to adjust the vertex weights a few times, but they turned out very well and natural looking! I believe the tail is weighted to the spine bone and the ears to the head. I didn't add any new bones or animations, all characters use the builtin skeleton and its animations only. It should also be noted that I got the face rig working too, so blinking and lip-syncing also work great. But the tail doesn't have use for new bones anyway, since it's actually an attached lwo. The characters are made out of 4 parts: The body (md5), the head (md5), the tail (lwo, attached to the body), and optionally hair (lwo, attached to the head). This was both to make it easier to mix species using universal bodies, and also because I'll make the head and tail work with existing bodies too (for guards, priests, etc). but they turned out very well and natural looking! Not yet, sorry. But I analyzed the walk cycle carefully during testing, and the digitigrade legs bend amazingly well with movement. Hey Kitsune! I've been testing out the characters for the past week. I like furry stuff too so I thought I would give it a try. I have been playing the "Trapped!" mission with the normal AI heads swapped for the anthro ones. I haven't played a full mission with a whole character though but have seen the animation you are talking about; I am very new to Dark Mod and still learning how to edit stuff. I have some video and will post it in this thread very soon. Once I do some more editing and play with the whole characters, I'll make post here detailing the experience. So far I like it! Edited by Salad Snack, 27 January 2017 - 04:05 AM. Edited by Salad Snack, 27 January 2017 - 07:58 PM. wait. wtf is that inventory? is new for furry patch? Nah the inventory is just part if that mission and changes based on the difficulty. The inventory grid was added last update. not updated TDM for time as it break some older mission i like to play. inventory is buttons  and 1-9 v, c, k, p, ¬, ;, ' and ~ all u need)) and scrollwhel but it can be accidented. Edited by pariah, 01 February 2017 - 11:03 AM. Updating won't break missions (with one exception). You just can't use old saved games. oh it is bind t _impulse30 for this inventory. it breaks mission i make with someone. Edited by grayman, 03 February 2017 - 10:42 PM. It was requested that personal information be removed. Argh... why did the forum decide not to notify me by email of replies here all of a sudden? Good thing I checked this. Love diiiis! Is that a mission you're working on that will use the models, or an existing FM modified? Note you might want to also add the tails to the body... just needs two lines in the def for the attachment. Thanks! It's a modfied version of Railgun's "Trapped!" FM. Yeah I've been trying to figure it out Dark Radiant and stuff. I'll do that so I can get tails. Also I am having a problem with getting the full characters to draw weapons since I couldn't find the draws_weapon property in the inherited properties. I put it in and def attached to the belt sheath. Used def_attach2 to leave the tail alone. The animation kicked in but the actual weapon wasn't drawn. I used the dagger. Is there something I am missing? Edited by Salad Snack, 08 February 2017 - 03:44 PM.